Home / Indian Football / General / Minerva Punjab FC ease past Youth FC with a 7-0 victory! Minerva Punjab FC continued their campaign with a solid victory against Youth FC of Rurka Kalan in their Hero Junior League – Punjab Zone qualifiers. 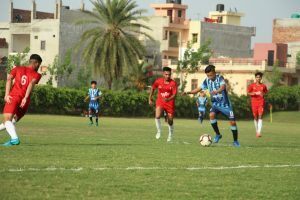 In the second matchday of the Punjab Zone, Hero Junior League, Minerva Punjab FC hosted Youth FC of Rurka Kalan at their home ground i.e Minerva Academy ground. The hosts dominated right from the start with a series of attack from both the wings. The constant pressure paid off in 14th minute when Samson’s supply was met by a neat finish from Himansu Jangra. Youth FC managed to keep Minerva Punjab FC from adding to the score but a simple mistake by their defender let Himanshu sneak in and score the 2nd goal in the 32nd minute. The things got worse for Youth FC when Abhishek Rattu was shown a straight red for a rash challenge on Himashu Jangra in 41st minute. The first half finished with a scorline of 2-0 in Minerva Punjab FC’s favour. In the second half, Minerva Punjab FC continued playing high in the opponent’s half and Tangva scored a beautiful goal by curling the ball into the outer post and putting Minerva Punjab FC 3-0 up in the 63rd minute. There was no looking back for Minerva Punjab FC and they managed to put four more goals in the remaining 25 minutes before the referee blew the final whistle. Himanshu completed his hattrick courtesy of a penalty scored by him in the 73rd minute. Samson, Mehron and Nadeem also managed a goal each in the 78th, 81st and 90th minute, respectively. The match finished with a score of 7-0 for Minerva Punjab FC. With this win, Minerva Punjab FC have managed to score 10 goals in two matches without conceding a single goal. They now sit on top of the Punjab Zone table with six points from two matches. Minerva Punjab FC travel to face RoundGlass Sports on April 19 for their next match of the Hero Junior League campaign. Previous XtraTime VIDEO: East Bengal vs Jobby Justin – now IFA is involved! Next France crowned first-ever FIFA eNations Cup champions!